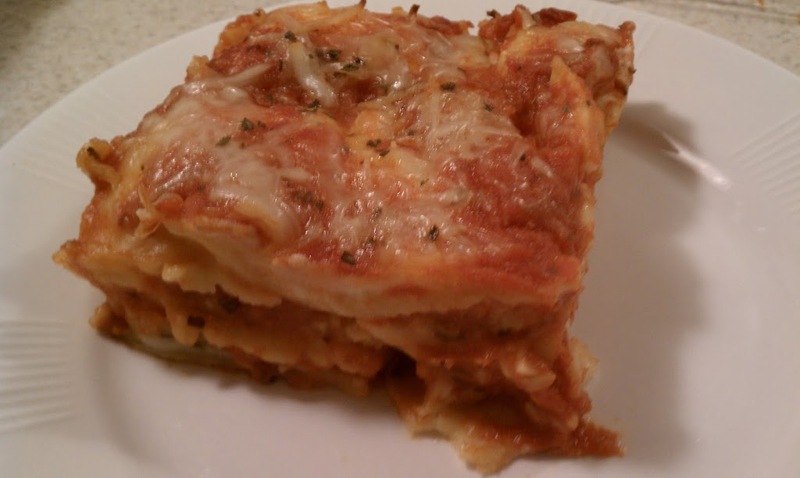 This is a great way to get all the flavors of lasagna with virtually none of the prep time. I made a few changes to the original recipe, including using less cheese, but trust me, it’s still plenty cheesy. The ravioli goes in frozen so your prep time is simply layering it with sauce and cheese. Delicious & easy! Spoon 1/2 c sauce evenly into the bottom of an 11×7 glass baking dish. Lay 1/3 of the ravioli (18 pieces…it should fit pretty much exactly into 3 rows of 6) in a single layer to cover the bottom of the dish. Spoon another 1/2 c of sauce evenly over the top. Sprinkle 1/2 c cheese over the top. Repeat the layering 2 more times starting with the ravioli. Sprinkle oregano on top. Cover the dish with aluminum foil and bake for 40 minutes. Remove the foil and continue baking uncovered 10 minutes. Let stand 10 minutes and then slice into 6 equal pieces. Made this dish tonight…it is definitely on my favorites list. I have to admit that I was a little skeptical at first but when I took it out of the oven, it looked so appetizing. I enjoy your blog, thanks for all the lighter, tasty meals. It’s making my weight loss journey so enjoyable & DELICIOUS! It’s definitely easy to throw together. Hope you like it! Made the Ravio-sagne for DF & I this weekend and it was delish! I used a 9×9 pan because it was all I had but it turned out fine cooking it as directed. We heated up the leftovers in the oven the next day for lunch and I dare to say it was even better when reheated! Thanks for another great one. WOW!! I had high expectations on this one based on the ingredients as well as my other experiences with your recipes. Let me say that it EXCEEDED MY EXPECTATIONS! Thank you for sharing such wonderful recipes! Is there any way you can post the nutritional info? I’m kind of on WW but I do not do the points plus system. I use the calories, fat, and fiber to figure out regular points. Thank you! I made this tonight for tomorrow’s dinner, and I couldn’t resist sampling it. Absolutely delicious, and a genius idea. This one is definitely going into our regular rotation, and onto my list of freezer meals. 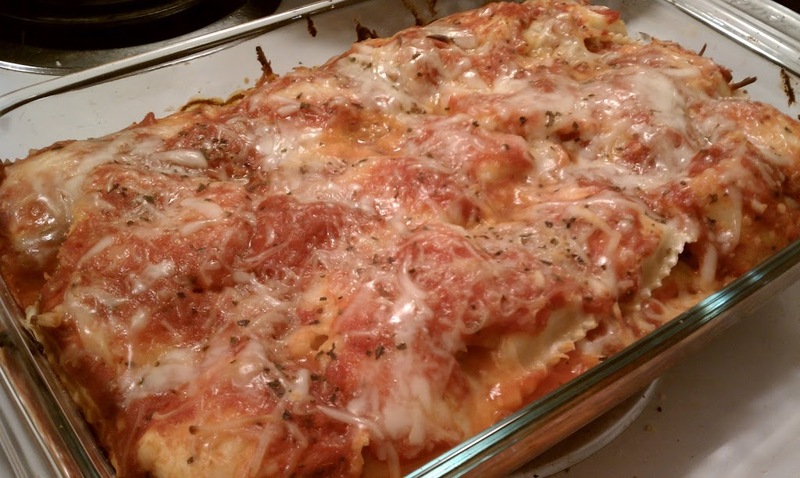 My guys and I loved this, and my husband usually isn’t a fan of ravioli. They thought I slaved for hours! Everyone asked me to hold on to the recipe. For anything this easy and this good, and that I can keep the ingredients on hand for, I’m sold! Thanks for another winner! If you add a pound of lean ground beef, what would points be? Hubby refuses to eat just cheese :(. Thanks! Sorry, I only have the points calculated for the way I made the recipe! I felt this recipe was lacking some vegetables. I sauteed leeks, shallots, garlic, spinach, red bell pepper, and mushrooms with olive oil and deglazed with bourbon(didn’t have any wine on hand). I added a can of crab meat and layered this combination with the ravioli and pasta sauce. This added 2 points to the total meal, but well worth it!. Made this last night and loved it! It is great warmed up for lunch next day too 🙂 And it’s boyfriend-approved – perfect!! I made this tonight and it was delicious. It was hard for me to stop eating!